It’s hard to find much wrong with the 2018 Fiat 124 Spider Abarth, even compared to the more famous Mazda Miata it shares underpinnings with. It’s sporty, fun and it zips around town like every day is a warm summer day. The problem is, eventually, somebody needs to bring the 124 back down to Earth. On the surface, Fiat Chrysler’s Italian-branded roadster seems like a carbon copy of the Miata—the 30-year-old car so universally enjoyed that it’s hard to describe succinctly without using a tired cliché—with a different face, engine and badges. But what takes the 124 from the mass market to the niche one is just that: The car hasn’t adjusted to account for the changes to the 2019 Miata, even in its 2019 model year. With how similar the two are, that’s a flaw neither FCA nor potential buyers can overlook. The term “Fiata,” which you’ve almost certainly heard, isn’t just a cheap jab at FCA for making a car similar to Mazda’s roadster more than two decades late. The cars are actually built alongside each other in Hiroshima, Japan, with the 124 sharing a lot of parts with the current-generation Miata. The story of their shared production dates back years, to when the fourth-gen Miata had yet to debut and when everyone, including Mazda, thought the car that would share the new Miata’s underpinnings would be an Alfa Romeo. But the honor went to Fiat instead, since the late FCA boss Sergio Marchionne wanted no Alfas to be built outside of Italy. Thus, the 124 was reborn with a Mazda soul, 75 percent of it made in Japan and another 20 percent in Italy. Inside of the 124, it becomes evident how similar the two are. This 2018 124 Abarth is a $35,765 car with a turbocharged, 1.4-liter, four-cylinder engine that sends power to the rear wheels through a six-speed manual transmission. The Miata has a 2.0-liter inline four without a turbo. The engine makes a rated 164 horsepower and 184 lb-ft of torque on the Abarth—Fiat’s sport trim designated by a scorpion and named after Karl Abarth, who raced and modified cars decades ago. That heritage is a big part of the car, too, with Abarth logos the size of hands all over it. Even if the people around the car don’t know what an Abarth is, they’ll know that this is one. The Abarth’s power number is just sightly up from the Classica and Lusso trims’ 160 HP, and, despite the Miata getting a significant bump from 155 to 181 HP for the 2019 model year, numbers did not change on the 2019 124 model. That’s a shame, because it makes it harder for the 124 to realistically compete. The car’s top Abarth trim has a starting MSRP of $28,295 for 2018 and $29,290 for 2019, while the 2019 Miata’s top Grand Touring trim can be had for a base MSRP of $30,780 and 26 additional HP—a decent price per power unit. But the 124 Abarth is still a good car, no matter how badly it needs to adapt. From the outside, the Fiat 124 is its own car. It’s got a unique design, which is hard to accomplish without morphing into straight-up ugly, and, in a world where more exhaust pipes mean more pizzazz, its four pipes are a nice touch. Inside, its Miata roots begin to show. The dashboard is Miata. The infotainment system is Miata. The stitching is Miata. The glovebox, cupholders, push-to-start button and climate controls are Miata. The gauge cluster has a setup similar to the one on the Miata. The door trims are decidedly not Miata, but that’s a topic for the next section. Just like the Miata, though, the 124 is fun. It handles well on curvy roads, goes through the six forward gears with near robotic ease, and has that same tight, new feeling a Miata does. The clutch is springy, the shift motions are smooth, and the car rivals the famously tight turning radius of the Mazda. The Recaro seats are comfortable, and the leather bolsters paired with Alcantara backs give the car a sporty vibe that, unlike fully leather seats, likely won’t soon be marred by material strain where a person sits. The car has a toggle below the shifter for sport mode, illuminating the word “SPORT” on the gear indicator—which, unlike the Miata, doesn’t nag the driver to upshift as soon as the car approaches 2,000 rpm. It’s hard to pick out much of a handling difference in sport mode, but the exhaust gets angrier and the car feels quicker on the gas. The exhaust in general is perhaps the best part of the car, and it’s certainly one of the main things that lets it peek through the shadow of its more established Mazda sibling. The 124 Abarth rips up to speed and crackles as it slows, but it’s not a misplaced tone as if it’s pretending to be more powerful than it is. Instead, it’s a farty little noise, which is far more appealing than it sounds—so appealing, even, that it’s much better than the 2019 Miata’s upgraded exhaust, which was a huge improvement over the 2018 Miata already. For those who want to listen to something other than the exhaust, everything on the 124 is accessed though Mazda’s current infotainment system. The screen has two main controls, a volume knob and one to navigate features, and can be used as a touchscreen when the car isn’t in motion. Like many automaker-designed infotainment systems, the Mazda one takes a while to learn. But it becomes simple over time, and the speakers connected to it in the 124 have decent audio quality even at 70 mph. The car has some highway noise, as all soft-top convertibles do, but it’s pretty well isolated in the cabin. Until recently, the 124 Abarth used to have one major but often overlooked perk: a voucher for a $999 one-day track experience included in its MSRP, whether a person leased or bought the car. That no longer applies for purchases after Jan. 1, likely related to issues at the school hosting it, and FCA said nothing further is planned at this time. That’s a huge loss for the Abarth’s value, considering that it was something the Miata didn’t offer. What the Abarth still has going for it, at least, is its warranty. 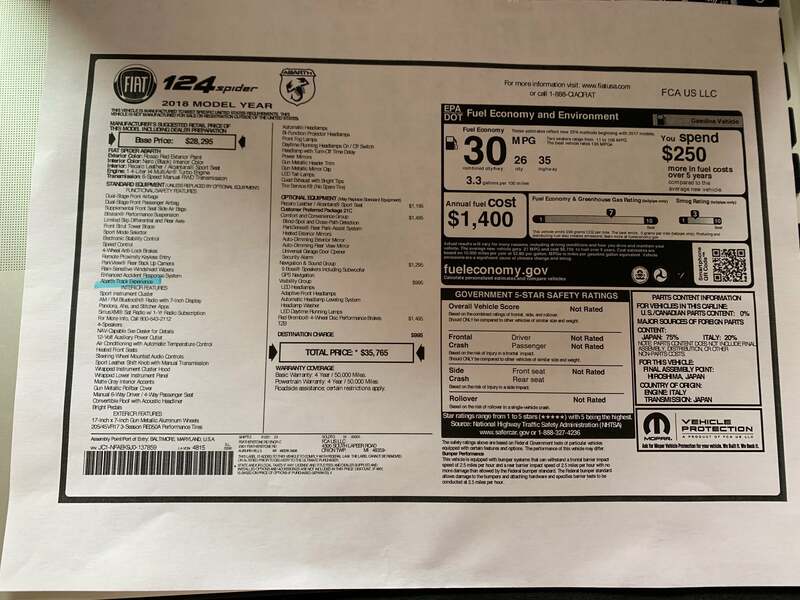 While Mazda offers the standard three-year or 36,000-mile warranty, the 124 and other cars in the Fiat lineup come with four years or 50,000 miles for both the regular and powertrain warranties. The 124 does lose out on that last part, though, with Mazda offering five years or 60,000 miles on the powertrain. The 124 Abarth arrived on a Wednesday night with an interior light out—a dark start, literally, to an otherwise great week with the car. But that’s not to say everything else was perfect, anyway. In terms of power in the Miata-124 relationship, the Fiat reigned up until the 2019 model year. 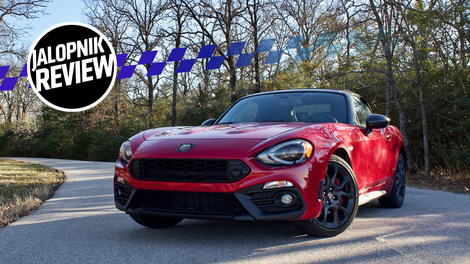 Now that 2019 is here, though, it’s hard to keep from directly comparing the Abarth’s 164 HP to the Miata’s 181. Since they run different engines, the 124’s turbo lag and sluggish acceleration under 3,000 rpm give it a different attitude than the more powerful Mazda. But handling is the selling point on these cars, not power, and some of that sensation of slowness can be redeemed by flipping the 124 into its jumpier sport mode. There are a few other inconveniences once the Abarth gets going, like its bright-red tachometer. It looks good when the car isn’t moving, but if a driver wants to shift at high revs, the numbers on the all-red tach become hard to discern. Instead of having the redline clearly marked with a red line, it’s marked with a thin, white checkered flag that blends in with the rest of the gauge. Checkered flags are usually a good thing, but this one makes it easy to slip up and hit redline—something an owner probably doesn’t want. The 124 is also tiny, like the Miata, and should have the most adjustments its small proportions can provide for different-sized drivers. But steering-wheel height ranges from low to super low—between a driver’s thighs, basically— which limits who can drive, and ultimately buy, the car. Aside from that, the shifter struggled to go into first several times during the week and the suspension was a bit sensitive, rattling over bumpy roads. The car did, however, take speed bumps at 25 mph surprisingly well for its size. But the biggest disappointment on the 124, by far, is its door styling. The 2018 and 2019 124 Abarth models only come with black interior options. Most of the interior is plucked from the Miata, which has a matte-like finish between the leather, dashboard and stitching. That same vibe is throughout the Abarth, up until the doors. They, instead, have a glossy, dated look that clashes—hard—with the rest of the interior. The black on the doors is a warmer tone, too, while the blacks throughout the rest of the interior are more gray. They simply look like they don’t belong, which is unfortunate in a car with so much going for it. And, given that the door is the first thing someone sees when getting in the car and the last thing they see when getting out, it’s hard to ignore. With a nearly $36,000 MSRP on this 2018 model and 2019 MSRPs that rival the new Miata, the 124 Abarth desperately needs to adjust to the market. It’s a good car in the segment, but the problem is that its direct competition has evolved. The longer Fiat warranty is a bonus, but outside of people who swear by the Fiat or Abarth brands, the 124 needs either a power increase or a price decrease to be truly competitive now—especially given the Miata’s more established base. Like the Miata, the 2018 Fiat 124 Spider Abarth is a car someone buys because they want to drive, not because they need it to get somewhere. It’s meant for enjoyment rather than practicality, and in terms of driving, the Abarth brings that enjoyment just as well as the Miata does. Fiat’s reluctance to adjust the 124 to the market, though, makes it hard to justify as a Miata competitor at MSRP. It relegates the Abarth, full of scorpion logos and Recaro seats, to a brand car rather than one someone could come to the lot and buy based on value compared to the competition—a car that requires a person to sacrifice certain perks in order to buy into their brand. The Abarth is a great candidate for a brand car, too, given its logos and extra touches all over. The unfortunate part is, it’s so much more than that—if only its price or its power figures would give it the chance to show everyone. The 2018 Fiat Spider Abarth is a great car with handling that rivals its Miata cousin, but its price and power figures need a reality check to be able to compete with that very car.